The Dynafluid range of water guns combine years of experience as one of the leading suppliers of wash-down systems throughout the world. Whichever model you choose, you're sure of top quality, with full service support to ensure many years of productive life from your Dynafluid water gun. With a precise, controllable water jet pattern and absolute cutoff on release of the trigger, there's no wasted water outside of the target area and no leaks. Tests have shown that water and energy savings of as much as 80% are possible compared to less sophisticated washdown methods. What's more, the operator does not have to walk back to the control valve or tap to stop the water flow, which saves valuable time and effort. All of the guns give one-handed use, with a choice of front pull or rear squeeze triggers, which are less tiring when used for long periods. The water guns are a favourite with operators, who appreciate the balanced design and shock-resistant thick rubber cover, which is ideal for the toughest of industrial environments. 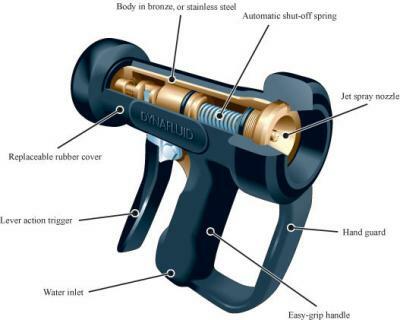 The Dynafluid industrial water guns are available as standard in bronze with a choice of black or white rubber covers. For hygienic applications in food processing or pharmaceuticals or where de-ionised water or corrosive fluids are used, models are available with stainless steel bodies and internals.